The Laziest Vegans in the World: Daiya Day! Quite possibly the biggest story of the year for Vegans, Daiya Cheese becomes widely available at Whole Foods Markets nationwide today. Why all the hype? Well Daiya is unlike any other Vegan cheese. First of all it has no soy which is pretty rare for Vegan cheese. Second of all it melts as if it were real cheese. I have a feeling that non Vegans looking for a cheese alternative will jump all over this. Third of all it tastes amazing! 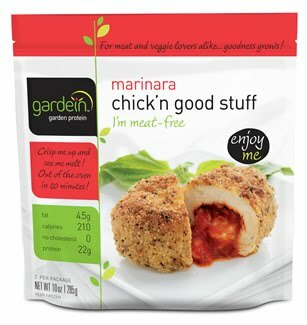 So the bottom line is Vegans now have a easier way to get Daiya and non Vegans will now have another option to try. In the end the cows win! To celebrate this glorious day I decided to cook with Daiya! I know, I know, Laziest Vegans is all about not cooking. This will be one of the few times I cook for this blog so don't get used to it. Basically I whipped up some of Isa Chandra Moskowitz's Chickpea-Hijiki Salad Sammiches and topped them with Mozzarella Style Daiya. For the last step I broiled them in the oven for 5 minutes. As you can see, the Daiya melts and browns as if it were dairy cheese. If you want to get REALLY lazy you could buy some English muffins and spaghetti sauce and make mini pizzas. 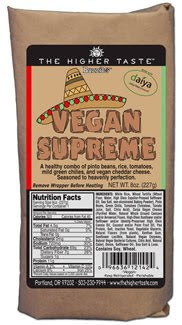 And if you are REALLY REALLY lazy, Daiya is already in some prepackaged Vegan foods. Out of these three the only one I've had is The Higher Taste Burrito. It was amazing as I'm sure the others are. mama's pizza on saddle creek has daiya cheese now. personally i only think it tastes good microwaved like on nachos or something. Hang in there, Teese has a stretchy version coming out in 3 weeks. I love Daiya but it's nice to have other alternatives. 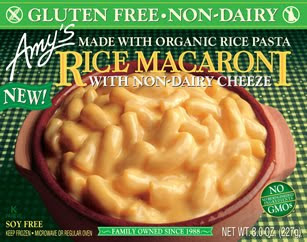 MORE yummy, stretchy vegan cheese?! I am in heaven. I like the cheddar Daiya better, but the mozzerella is pretty good. I find I have to hit the broiler for a little bit to get it to really melt, but it's all good. I'm actually looking forward to winter so I can have grilled cheese sandwiches and tomato soup! i REALLY like the cheddar microwaved on top of some nachos. i love how if you overcook the daiya it gets bubbly and hard. i used to love doing that with real cheddar cheese shreds. I love your blog! Will have to look for this delicious cheese. The soy stuff has always freaked me out a little. daiya makes THE BEST grilled cheese sandwiches, good gracious. and we've made nachos with it the past two days, also delicious. i seriously love the stuff.